Sometimes you want the best of both worlds. You crave the peace and quiet of a private villa, but don’t want to forgo the service you’d get at a five-star hotel. Well, how does a fully-staffed luxury villa sound? Located in Laem Sor bay, one of the most beautiful travel destinations on the southern coast of Koh Samui, Thailand, the stunning Villa Kirana can easily accommodate up to twelve people, making it an ideal choice if you’re travelling with family or friends. Tucked away from busy tourist areas and fringed with coconut plantations, Laem Sor offers powdery white sands, sparkling turquoise waters and spectacular views across to the neighbouring islands of Koh Tan and sunsets over the mainland. Add to this the luxurious facilities and first rate service of your home away from home, and you could be forgiven for thinking you’ve landed in paradise! 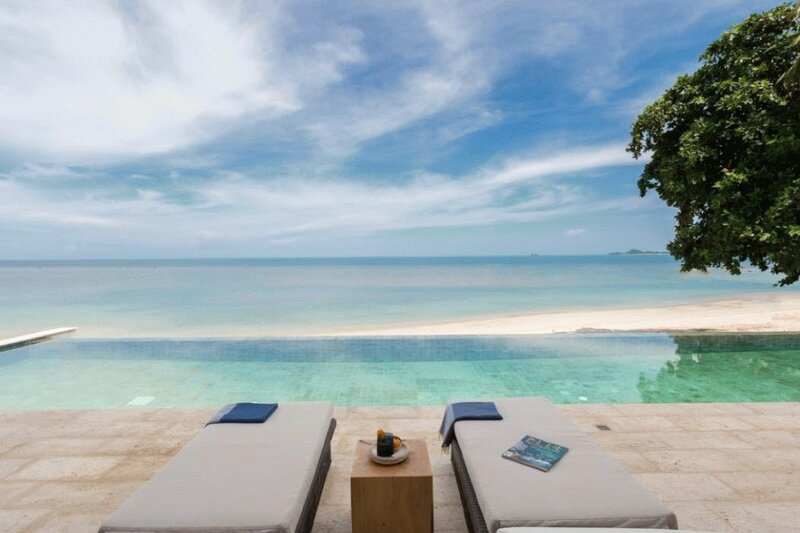 British Airways, Malaysia Airlines and Air France all offer connecting flights to Koh Samui from London Heathrow, while the villa is located about a 45-minute drive from the airport. In an enviable beachfront location in one of Koh Samui’s most exclusive bays, Villa Kirana is eye-catching and beautiful. The design aesthetic is contemporary Balinese, with striking, cutting edge architecture complimented by the impeccably tasteful décor of the interior. 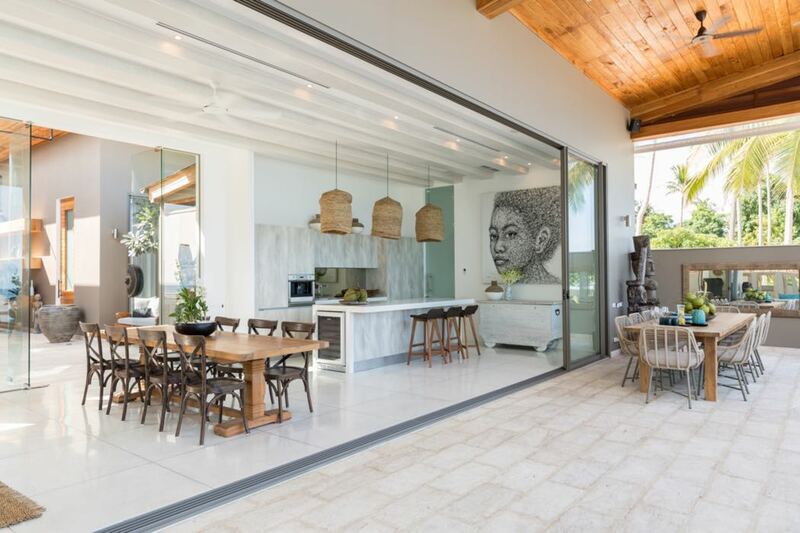 The villa is open plan, with seamless divisions and oversized doors and windows giving an overriding feeling of calm and above all, free-flowing space, which lends itself beautifully to the tropical climate. Villa Kirana also makes the most of its position, with everything being at ground level for ease of access to the beach and with the large windows celebrating the spectacular landscape and sunset views. 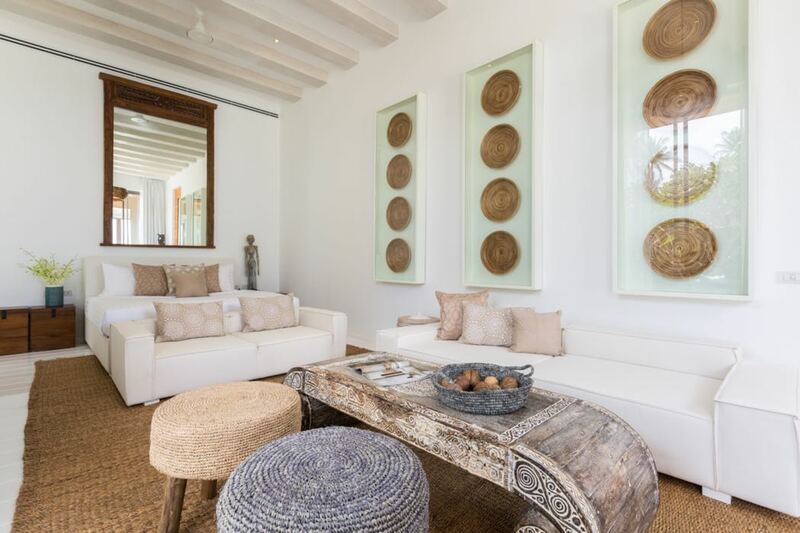 Décor is modern and fuss-free, with a colour scheme inspired by the beach and a preference for simple furnishings and a few well-chosen statement pieces. Villa Kirana offers six ensuite guest bedrooms in separate bedroom pavilions, although with family and safety in mind, a children’s room adjoins one of the pavilions. The huge master suite, with its vaulted ceilings and stunning design, is something quite special. Boasting views of the pool and the bay beyond, it features a king size bed, separate seating area and 40” TV screen. 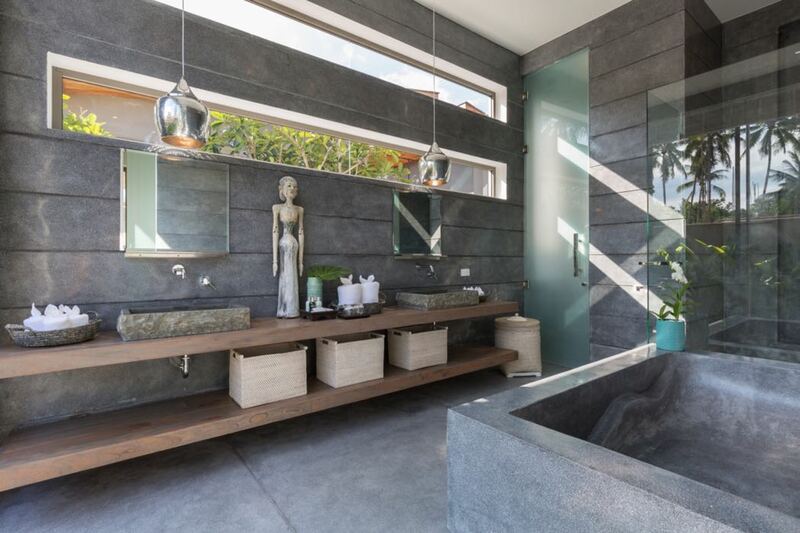 The grey terrazzo bathroom has both a lovers’ double shower and lovers’ bathtub, while there is also a private garden attached to its own deck and seating area. All the rooms are spacious, with sumptuous bedding and both indoor and outdoor seating areas, while the children’s bedroom has bunk beds to accommodate up to four children and a large play area. In addition to the bedrooms, Villa Kirana also benefits from a relaxing, air-conditioned living area with TV, a dining area and a fully fitted kitchen with an oven, gas stove and microwave as well as a coffee machine, blender, toaster and breakfast bar. Hairdryers, bed linen and towels are all provided. Outside, there is a 21-metre infinity pool, a separate kids’ pool and both sunny and shaded lounging areas with sun loungers as well as a BBQ/bar area. The garden is a delight, filled with palm trees, orchids and fragrant jasmine. You will also find plenty of parking space and a rooftop terrace. As if staying at the magnificent Villa Kirana wasn’t enough, there’s an attentive team of discreet, professional staff on hand to make sure you don’t have to lift a finger during your holiday. The chef will prepare meals tailor-made to your taste, using local ingredients, while you can also take advantage of the nanny service if you have small children, and the in-villa spa service if you feel like a relaxing treat. There is a driver on hand for excursions – whether you want to go exploring or just pick up supplies at the local supermarket – and the villa manager is there to make sure that everything runs smoothly and that you get the best possible experience. With that gorgeous infinity pool all to yourself and a beautiful beach on your doorstep, you could be forgiven for wanting to spend all your time at the villa, but if you do feel like venturing out, the Samahita Retreat is close by, where you can enjoy yoga and delicious, healthy cuisine. You can also take day trips to Koh Tan and Koh Matsum islands – the departure dock is just a short walk from the villa – or ask your driver to take you to experience the nearby waterfalls, elephant rides or local villages. Further afield, there are towns with more of a buzz about them, where you can enjoy shopping and nightlife. It really depends on how much or how little you feel like doing! Villa Kirana offers you the best of both worlds – the privacy of a villa with the service of a luxury hotel – in one of Koh Samui’s most beautiful spots. 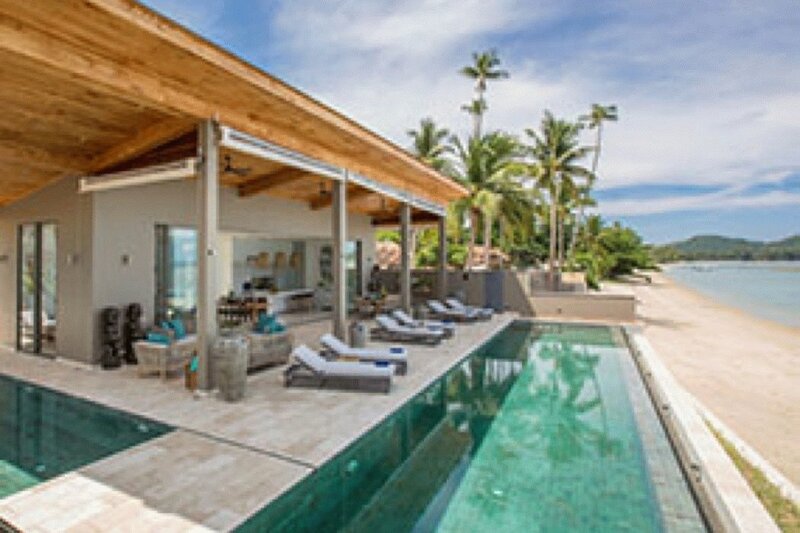 Villa Kirana features in our top 5 best beach houses in the world.